ST. GEORGE — An evening of dining, inspirational speakers and dancing under the stars, billed as “A Night of Inspiration,” will be the fare for those attending Saturday night’s scholarship gala put on by the St. George Branch of the American Association of University Woman. The gala will be held at the DiFiore Center, 307 N. Main St., in St. George from 6-10 p.m. Tickets are $75 per person, available online. 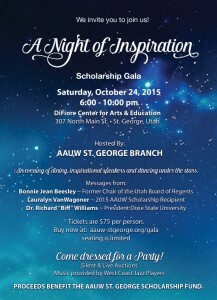 Inspiration will be brought by speakers Bonnie Jean Beesley, former chair of the Utah Board of Regents, Lauralyn VanWagoner, 2015 AAUW scholarship recipient, and Dr. Richard “Biff” Williams, president of Dixie State University. Then comes the taste, she said. Polanowski saw the importance of how foods look while watching 30 hungry cowboys “dig in” or lean back when they sat down to the food she fixed for them while growing up on her family’s dude ranch in Wyoming. Polanowski spent most of those seven years learning how to be a professional chef, she said, until seven months ago when she opened her Just A Little Bite Cooking Company in St. George. 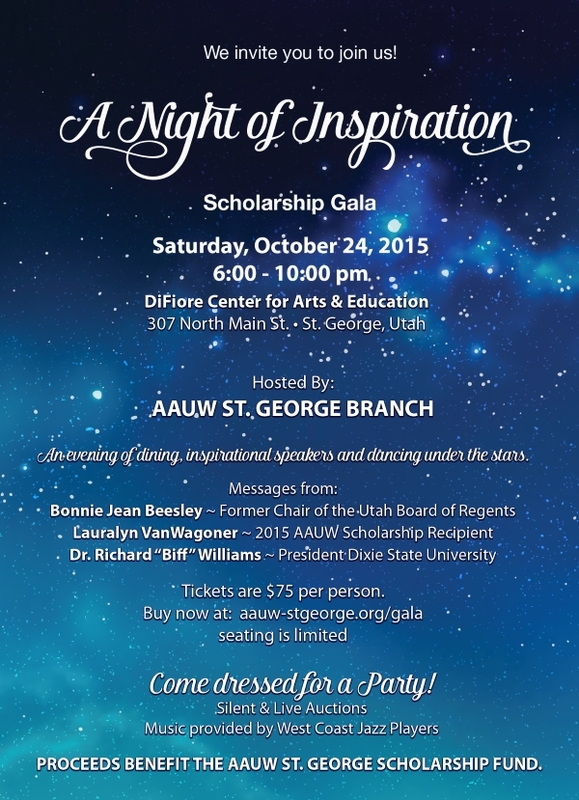 The scholarship gala will be held Saturday, 6-10 p.m. at the DiFiore Center, 307 N. Main St., in St. George. Seating is limited, and tickets are $75 available for purchase online. Speakers include Bonnie Jean Beesley, former chair of the Utah Board of Regents; Lauralyn VanWagoner, 2015 AAUW scholarship recipient; and Richard “Biff” Williams, president of Dixie State University. The American Association of University Women is the nation’s leading voice promoting equity and education for women and girls. Since its inception in 1881, AAUW members have researched and taken positions on the fundamental issues of the day: educational, social, economic and political. The AAUW St. George branch is an extension of the National AAUW. Founded in 1981 their mission is to help advance equity for women and girls in Utah through advocacy, philanthropy and education. When: Saturday, Oct. 24, 6-10 p.m.